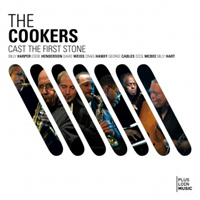 Cast the First Stone is the sophomore follow-up to Warriors (Jazz Legacy Productions, 2010), the debut recording of the all-star ensemble The Cookers, whose name was inspired by the 1965 Blue Note live album series Night of the Cookers. Lending credence to its namesake, this powerhouse septet swings mightily through a series of post-bop originals and a sole cover, bolstered by the presence of special guest, acclaimed saxophonist Azar Lawrence, whose recent resurgence has found the renowned firebrand in riveting form. Formed by trumpeter and musical director David Weiss, the group boasts a stellar lineup of revered veterans; most rose to prominence in the late 1960s and early 1970s. 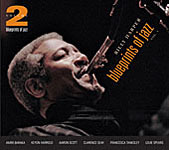 Trumpeter Eddie Henderson and drummer Billy Hart gained recognition as members of Herbie Hancock's influential Mwandishi sextet, while tenor saxophonist Billy Harper played with Art Blakey, Lee Morgan, and Max Roach. Bassist Cecil McBee and pianist George Cables share decades of sideman experience between them and alto saxophonist Craig Handy is a longstanding member of the Mingus Big Band. Following in the footsteps of their debut, Cast the First Stone covers a similar range of material, veering from lush ballads and bluesy mid-tempo swingers to rugged up-tempo burners. Conveying the casual air of a jam session, these seasoned soloists stretch out with spirited verve, extrapolating inspired variations from sophisticated arrangements of familiar themes with a shrewd awareness of song-craft. A trio of robust ballads spotlights their understated lyricism; Henderson's muted horn ruminations ("The Peacemaker"), Lawrence's sinuous soprano musings ("Looking for the Light") and Cable's effervescent pianism ("Think on Me") resound with the wisdom of experience, adroitly underscored by the rhythm section, whose keen interplay is a recurrent source of beguiling detail. Providing dynamic contrast to the date's more reserved fare, the testimonial fervor of Harper's intervallic cadences on the titular opener establishes the album's underlying tone with an evangelical urgency worthy of its title. Harper's rousing choruses on the gospelized hard bop of "The Seventh Day" and his waltz-funk classic "Croquet Ballet" are equally impassioned, inspiring compelling statements from Weiss on the former and Handy on the later. A blistering version of Harold Mabern's "The Chief" ends the record on a high note, with a vociferous tenor chase between Lawrence and Harper that raises the rafters. A cohesive and focused effort that lives up to its all-star billing, Cast the First Stone transcends the clichés that hinder many similar sessions. Forging ahead on their second release together in as many years, these legends ply a vivacious strain of muscular acoustic jazz that establishes an historical through-line to the innovations of past masters, keeping the faith with passion and grace. Track Listing: Cast the First Stone; Peacemaker; Looking for the Light; The Seventh Day; Croquet Ballet; Think on Me; The Chief. Personnel: Billy Harper: tenor saxophone; Eddie Henderson: trumpet; David Weiss: trumpet; Craig Handy: alto saxophone (1-5); George Cables: piano; Cecil McBee: bass; Billy Hart: drums; Azar Lawrence: soprano saxophone (3), tenor saxophone (4, 6, 7).